50% OFF SALE! Only at Welda Solar Shading Systems. For more information on the products and services offered by Welda Solar Shading Systems in Toronto, please contact us. Like finely crafted wood furniture, the natural beauty of Cashmere Hardwood Shutters will add richness and warmth to your home. 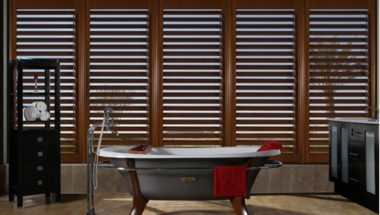 These shutters have a superb lustrous finish, superior structural integrity and durability. Available in popular shades of white and rich lacquer stains. 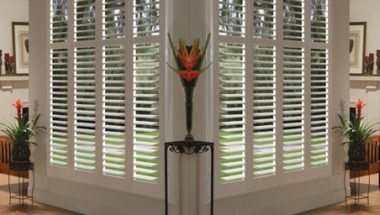 Quality fauxwood plantation shutters custom made, craftsmanship, extremely durable, water proof and beautifully finished with water borne coating. Maxxmar Eleganza Sheer is the newest introduction to the shadings product category. The vanes which have a soft drapery look rotate for privacy while controlling the light in a room. The perfect solution for sliding glass doors or large expanses with widths up to 144″ and heights up to 108″. Classic pleat size of 3 ½” and wand control operating system is ideal for child and pet safety. Maxxmar Opera Eleganza Sheer has an assortment of soft fabric bonded to fabric vanes on the front shade and Ecoflex fabric is standard on the back shade in our proprietary opera system. Superb Paint and Lacquer Finishes. Available with Standard Frames or No Frames. Price inclusive of 4 Standard Frames. The exclusive Enduralink™ connectors are used to attach the louvers to the tilt bar. No staples are required. Option of Tilt Bar Placements. Computerized positioning of the louvers permits variable equidistant placement of the louvers. Designed with Child Safety Features. 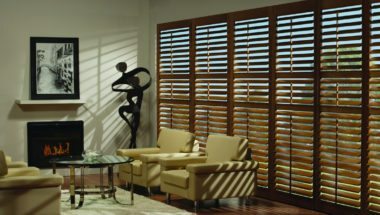 When shopping for an original blinds consider Welda Solar Shading Store!